If you follow me on Instagram, you may have seen a quick post I made about the new Bundle Monster Mochi Stamping Station. 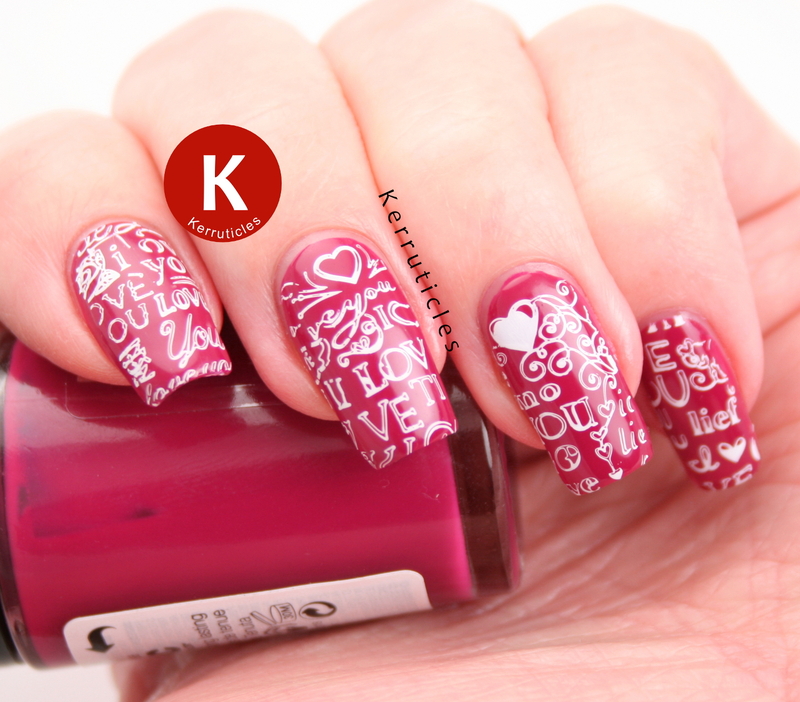 I’ve now had a chance to try it out and have created my first manicure using it: some pink “I Love You” nails. First off, this stamper is huge. The stamping surface measures 11.8cm by 4.9cm and it’s soft and squishy. It has about the same amount of give as the original Creative Shop stamper. 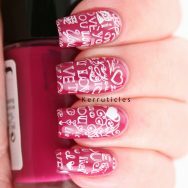 For these nails, I have a base of NYC Rosy Nose, a deep fuschsia colour, and I’ve stamped over it using Essence Stamp Me! White. The plate I used comes from the recently released Bundle Monster Occasions collection, called Spring Time. This ten piece set consists of square plates, around the themes of love (for Valentine’s Day), Chinese New Year and spring flowers. Five of the plates are buffet-style full images, and the others either have large nail designs or smaller motif images. The set is currently on sale for just $12.74. To stamp an entire plate, you need a slightly different application of polish. I put a line of polish at the top of the image, as normal, but then another line about half way down too. This was just to ensure that I could cover the entire surface of the plate when I scraped. Then I rolled the Mochi Stamping Station over the image. You can stamp an entire rectangular plate in this way, so it’s perfect if you want to stamp a whole manicure using just one image. 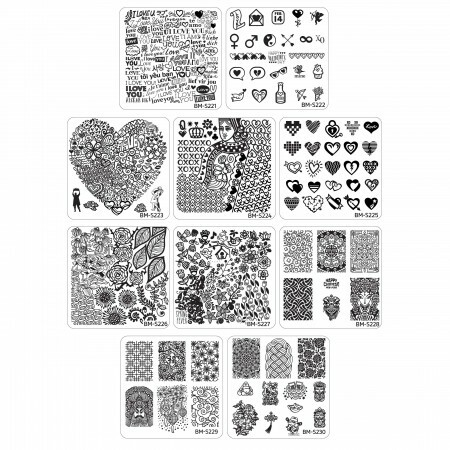 It will easily stamp the large rectangular Bundle Monster, MoYou London and Born Pretty Store plates. To transfer the imaged to my nails, I left the stamper sitting on my desk with the squishy part upright and then placed my nails into the areas that I wanted to stamp from. 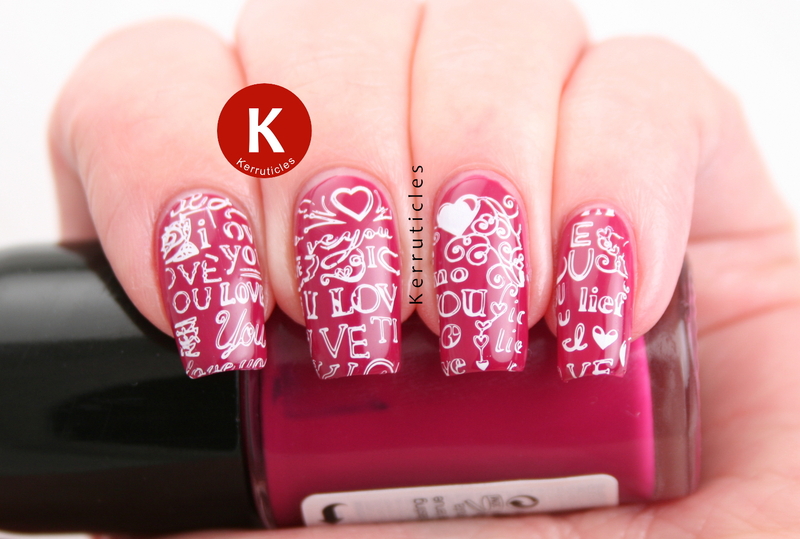 It was so easy and while I only did four nails for this manicure because I was in a hurry to get it posted today, you could easily stamp a whole two hands’ worth form this stamper. The stamper doesn’t necessarily need any preparation. I’ve seen a review where they haven’t needed to. But if you want to, you just buff it gently with a magic eraser or nail buffer. You can clean it with a lint roller, but it’s also OK to use acetone on this. use it to create decals / reverse stamping decals on. use another stamper to stamp multiple images onto the Mochi Stamping Station. That way, you can repeat an image many times, which would be useful if you’re creating decals. you needn’t worry about leaving the stamped image too long on the Mochi Stamping Station. You can always top coat your nails one at a time and leave until tacky. Then it will pick up the image from the Mochi Stamping Station just fine. use it to pick up watermarbles. You can then leave them to dry on the stamper and cut them out later as decals. The Mochi Stamping Station is available tomorrow, 4th February 2016, on the Bundle Monster website. I am excited to use it for other manicures and in other ways too. Just when I thought everything nail art related had already been invented, along comes something new. Bravo Bundle Monster – I love your new idea! The Bundle Monster Mochi Stamping Station and plate BM-S221 were sent to me for review. All views expressed in this post are my own, honest and unbiased opinions. I think that stamper is so cool! Definitely a neat addition for the stamping world. A nice manicure you got using this mochi stamper. Love the idea of it and it seems to work really well too. Yes, i am really pleased with it. It will get a lot of use. Did you order one? I checked the page on the BM website – I think it’s good value for $12.59. OMG! What ever will they think up next. I thought the clear stamper was an invention – but this?! Need a vid please . . . I don’t have the first clue how to shoot and edit a video, unfortunately. But a few bloggers – and Bundle Monster – have already done some videos. Just search for Mochi on YouTube.